The first national forests were set aside more than 100 years ago. Under Forest Service management they were intended to provide a continuous flow of water and timber for Americans. By the 1980s the agency provided about 25 percent of US softwood lumber consumption. 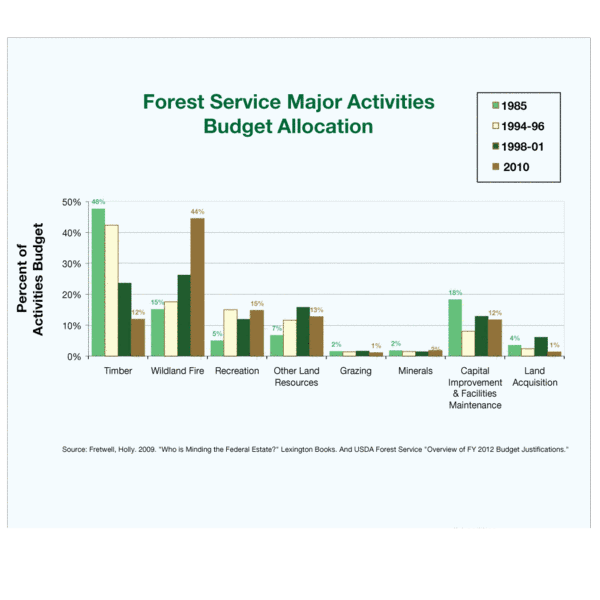 The timber budget was the largest of all agency activities (see chart). Timber harvest on the national forests has declined by more than 80 percent since 1985. The current agency mission is ecosystem protection but spending has shifted to wildfire management which now makes up nearly half of the agency’s budget. More than half of that is for fire suppression. Nonetheless, wildfire burned nearly 70 million acres over the past decade. Historically, the Forest Service has not been able to provide Congress or the public with a clear understanding of what the Forest Service’s 30,000 employees accomplish with the approximately $5 billion the agency receives each year.